If you like the larger end of the scale for compact pistols, the Sig Sauer M11-A1 is a popular choice amongst gunowners. It is easy to keep a firm grip on this handgun, and it is small enough to discretely conceal or carry at the hip. We’ve put together a review for some of our favorite Sig M11 A1 holsters below, and we’ll let you know which we think is the best option for the majority of gunowners at the end of this article. We tried to keep the holsters within this review at a very affordable cost for those with a tighter budget. While you won’t see much steerhide or saddle leather amongst these options, we want you to know that you don’t need to be brainwashed into thinking those are the only effective and best materials for a good quality holster. Nylon, kydex, polymer, and softer leathers can all make for great Sig holsters, and focusing on craftmanship will lead you to a happy purchase. Materials – The Ace Case Sig Sauer M11-A1 IWB Holster is entirely made in the United States of genuine leather. It can be purchased in various earth tones, including black, tan, and dark brown. A single metal clip is used to secure the holster to the wearer’s waistband. The barrel and trigger guard of your Sig Sauer M11-A1 are completely concealed, with both the bottom and top of the holster left open ended. The inside is lined with a soft material to avoid scratching any parts of your concealed weapon, and the lining also helps enhance a smooth draw and re-holstering. This Ace Case IWB holster uses Level I retention, and a textured exterior on the leather helps secure a grip inside of the waistband. Stitching across the entire outline of the holster also enhance the retention level. Performance – The Ace Case Sig Sauer M11-A1 Concealed IWB Holster is a great little piece of equipment to pick up for anyone who needs a simple holster that still looks nice. If kydex or polymer are too uncomfortable for you, whether inside or outside of the waistband, a soft leather like the one making up this holster is a good choice for you. This holster is also cheap enough to use if you’re just testing out concealing your compact handgun in public. Our only complaint is also just that: the materials are definitely cheaper on this holster, so we don’t suggest this purchase for anyone who very actively uses their concealed carry. This may be easy to guess, anyways, because of the Level I retention. While the soft material inside of this holster is helpful in protecting your weapon, you’ll need a tight fit to ensure nothing will slip or slide around while going about your day. What we say – The Ace Case Sig Sauer M11-A1 Concealed IWB Holster costs under $20 online, which makes it the cheapest option within this review. 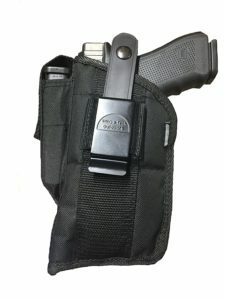 If you need a simple holster that you would like to occasionally carry with you or leave in your car, this would be an excellent choice to look into. Materials – The Pro-Tech Outdoors Sig M11 A1 Holster is constructed of cordura ballistic nylon, and it is double stitched with additional strong bonded nylon. These Sig M11 A1 holsters are comfortable to wear without being too flexible or elastic. Inside of this nylon holster is a vinyl vapor barrier, which protect your concealed carry weapon form any moisture, as well as dust or dirt. The interior is also lined with foam padding and additional nylon to protect your Sig Sauer M11 A1 from scratches or other damages. 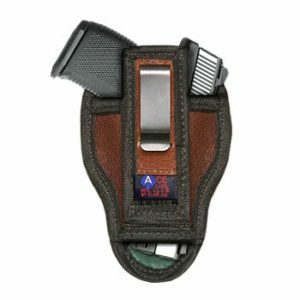 This Pro-Tech Sig M11-A1 holster attached to your belt with a metal clip and webbing loop. It is ambidextrous, and it comes with a plastic adjustable spring action thumb break. In addition, there is a small pocket in the front of the holster for an extra magazine. Performance – We really enjoy a lot of what Pro-Tech has to offer, and their Sig Sauer M11 A1 Holsters are no exception. For a nylon holster, this is one of the best we have been able to find on the market. Most impressive is the extra lining and vinyl vapor protection to keep out moisture and debris. This means, despite not having a polymer, kydex, or leather holster, a little rain shouldn’t cause any problems or damage the holster or handgun. Our biggest complaint is that we wish the belt loop attachment was a little more secure. While this holster won’t come flying off your belt, the webbed looping allows for a little movement on the waistline. This may be more of an issue if you are utilizing the extra magazine pocket. Ultimately, however, we give this Sig M11-A1 holster a big thumbs up. What we say – The Pro-Tech Sig Sauer M11 A1 Holster costs just over $20 online, so it’s another very affordable and realistic option for anyone who doesn’t need to empty their wallet for a holster but still needs a functional product. This is also a great choice for anyone who does intend to see a little more action with their Sig. Materials – The Hybrid Hidden Holsters Concealed Carry M11 A1 Holster is entirely made in the United States. The holster itself is constructed of durable kydex, and it has a large back panel made of leather. The back panel is also lined with suede to create some friction and keep the concealed holster in place during your daily activities. There are two metal clips on either end of the panel to secure the holster to your waistband. The kydex is molded and is only .093 inches thick, so it is perfectly shaped for your Sig Sauer M11 A1 and takes up as little additional space as possible. There are two screws at the trigger guard and next to the barrel, so the retention can be adjusted to your likeness. Screws on either metal clip are also adjustable for your preference. 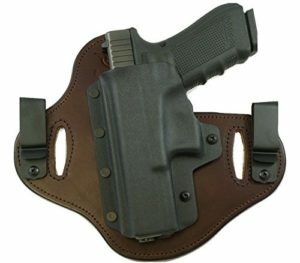 This Hybrid Hidden Holster can be purchased in black or dark brown. Performance – Hybrid Hidden Holsters offers a different style of concealment with their Sig Sauer M11A1 holster. We appreciate that weight and friction can be distributed across the leather back panel, and the extra thin kydex protecting your pistol adds as little additional weight to your hip. Anything adjustable also gets our attention, so the four screws for adjusting height and retention on this holster makes us feel comfortable in saying that almost anybody should be happy to purchase this option. We will say that we wish there was something inside of the kydex holster to aid in protecting your weapon. While you can adjust the tightness here, bumps and small movements can still happen, so we’re slightly concerned about scratched or dings. However, this is a minimal concern compared to the qualities this holster offers. What we say – The Hybrid Hidden Holsters Concealed Carry Gun Holster costs about $70 online. This price covers a higher quality leather, high quality kydex, and more retention and adjustability. If you prefer a wider holster to distribute friction, as opposed to a compact IWB holster, then we definitely suggest looking into this option. Materials – We rarely review a Level III retention gun holster, so this one is pretty cool. The IMI-Defense Z1390 Sig M11A1 Holster was initially designed for military and police personnel, but why shouldn’t everyday gunowners get their hands on the best of the best? 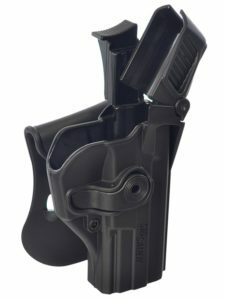 This holster is made entirely of durable polymer, and it has a wide belt clip. The larger clip makes it possible for this holster to be worn at essentially any position on your waistband: on the hip, small of the back, or for cross draw. There are adjustable tension screws that can be manipulated with an included allen key. There is a dual retention safety system installed, and an easy depress lever releases your weapon for a quick draw. Re-holstering your Sig keeps it tightly locked on place until its next use. Performance – The IMI-Defense Z1390 Sig M11A1 Holster is a great option to look into if you’re in active duty or if you simply want the added levels of security. While it’s not an IWB holster, you can expect yourself to be prepared at a moment’s notice, and your Sig will be well protected from outside elements. We have zero complaints about Level III retention, as well as the couple of adjustable screws. The wider belt clip allows for a better distribution of weight on your hip. 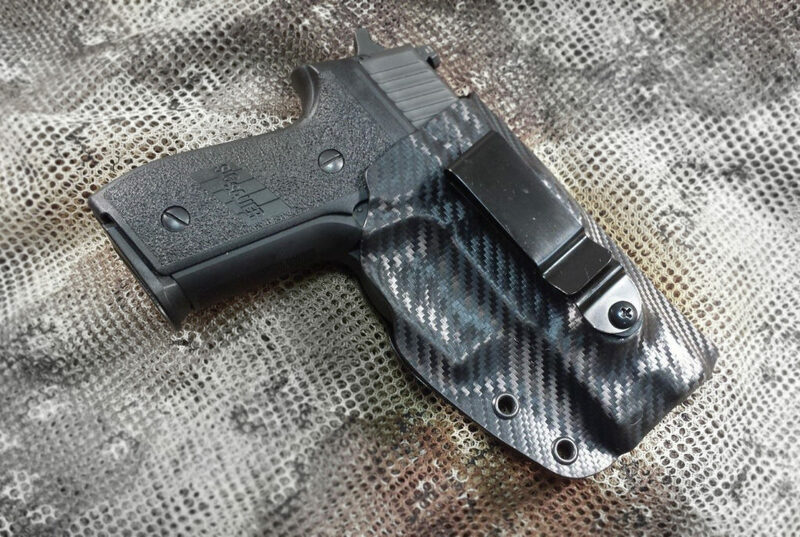 Our only complaint is that the price seems a little high for an all polymer holster, but that will be up to the buyer’s preference if they mind that or not. What we say – The IMI-Defense Z1390 Sig M11 A1 Holsters go for between $70 and $80 online, making it the most expensive option within this review. 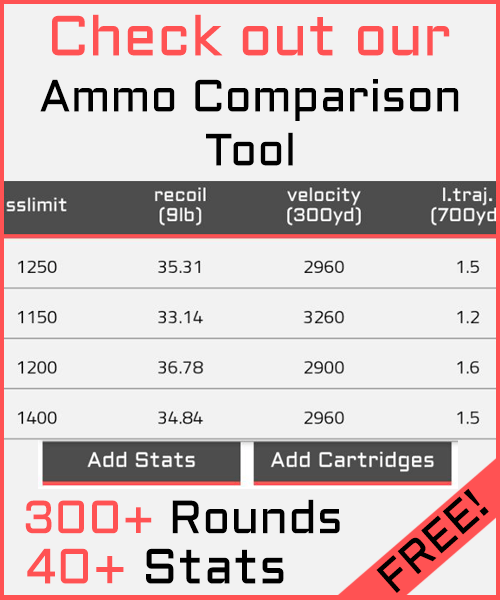 While the price is a little higher for a polymer holster, you’re paying for the innovative design and higher retention level. You can expect to get a lot of good use out of this baby. We’d have to say our top pick goes to the No products found.. Although it is on the more expensive end of this review, $70 is still a pretty affordable price for an IWB holster. This is one of the more comfortable holsters we’ve tested out, thanks to the wider back panel of leather and suede. Kydex provides a great protective and durable barrier, and the whole holster is very adjustable. We think many gunowners would be happy with this purchase.